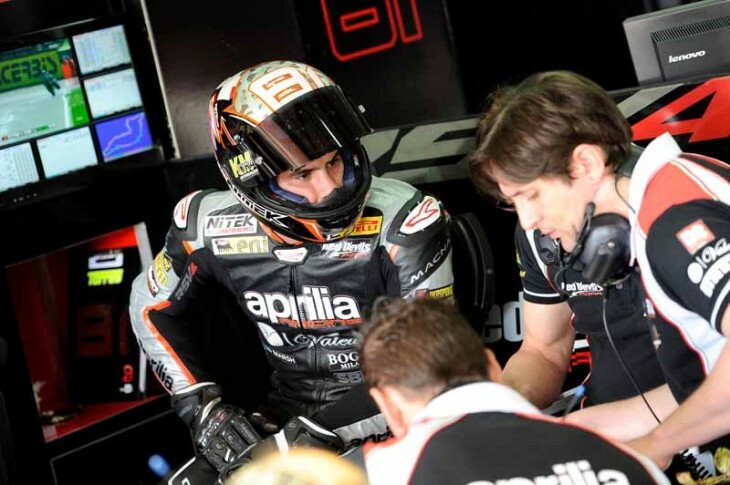 Imola, 9 May 2015 – The Superpole held today at Imola had the Team Aprilia Racing – Red Devils garage on the edge of their seats. Easily qualifying for the final session, Leon Haslam and Jordi Torres took all their determination to the track, in the end bringing home two spots on the second row of the grid. But the biggest result for both of them goes beyond the times they put on the sheets. Haslam, improving consistently, started with a race tyre when the lights turned green. As always the goal was to gain confidence with the bike and track before putting on the special soft tyre in search of the best possible time. Unfortunately the plans that Leon and the team had made were changed by a crash on the Variante Alta, fortunately without any harm to the rider. It was the Brit’s RSV4 RF that paid the price, with the mechanics managing to get it back on the track in record time, but with an abnormal slant on the right semi-handlebar. Despite the problem, Leon was still able to put in a flying lap that will place him on the fifth spot on the starting grid for the races tomorrow. The nice surprise of the day was Jordi Torres’ improvement, on his absolute maiden ride on this circuit which puts even the most expert riders in difficulty. The Spaniard took full advantage of the Pirelli soft tyre on his flying lap, placing behind his team mate on the second row straight away. This is a respectable result for a rider who has already demonstrated his skill setting a good race pace. Back after a four-round absence and it’s pole position for Giugliano and the Aruba.it Racing – Ducati Superbike Team!